Publisher: BRAUN,G. / HOGENBERG, F.
Size: 13.2 x 16.2 inches. Colouring: In very attractive original colours. Condition: Latin text on verso. Some marginal tumbling and some very light toning in center fold and some offsetting due to oxidation. Repair of a small tear in upper part center fold. Altogether very good and in very attractive original colouring. 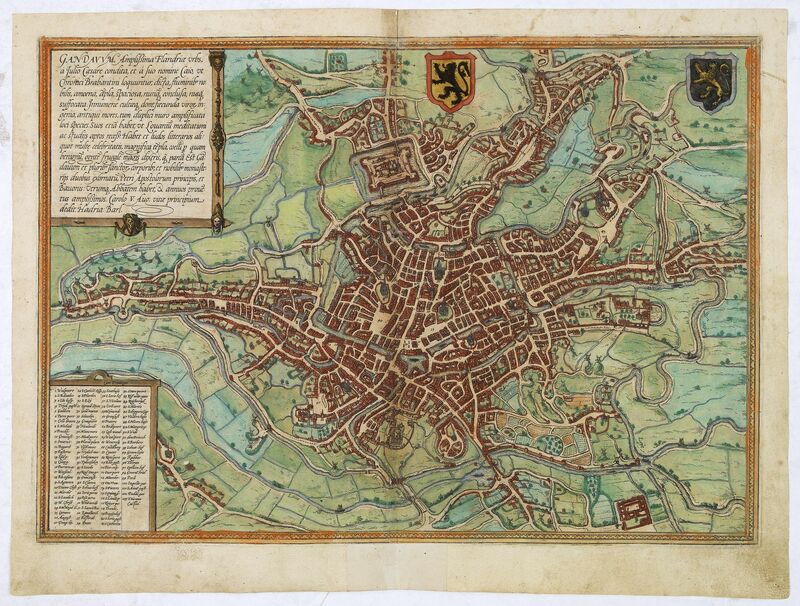 Very desirable and early town-plan of Ghent. In lower left corner a numbered key (1-103). "The view of Ghent shows the city from the northwest in plan view from a great height. The historical core of the city occupies the peninsula between the two Rivers Schelde and Leie. The cathedral of Sint-Baafs (51) is almost at the very center of the map: it houses the famous Ghent Altarpiece painted by Hubert and Jan van Eyck. Together with the Gothic church of Sint-Niklaas (57) lower down and the nearby Sint-Jacobskerk (43), Sint-Baafs serves as one of the three main orientation points inside the city center. Within this triangle stands the 14th-century belfry (55), 118 m high, which forms part of the cloth hall. The former Sint-Baafs monastery lies somewhat outside the city center and is surrounded by fortifications and moats (103). Ghent, which is situated to the northwest of Brussels, derives its name from the Celtic ganda , meaning "confluence". As a leading center of cloth production, in the High Middle Ages, Ghent rose to become a major power with a flourishing economy and together with Bruges was the most important center of commerce in Flanders. From the 13th to the middle of the 14th century Ghent was the second-largest city in northern Europe after Paris, with some 60,000 inhabitants, but in the second half of the 14th century these numbers began to decline. From volume one of the greatest publication in this genre!. The Civitates was compiled and written by George Braun, Canon of Cologne Cathedral. Braun gathered together vast amounts of information and draft plans to produce over 500 city views/maps published in six parts between 1572 and 1617. Most of these engravings were made by Simon Novellanus and Frans Hogenberg, many after drawings by Joris Hoefnagel. Read more about the Civitates Orbis. Reference: Koeman (1967-70) B & H 1-5, NMM III, i, 459 (1573-1618 ed. ), Introduction', in: G. Braun and F. Hogenberg, Civitates orbis terrarum (Amsterdam: 1965). (2).